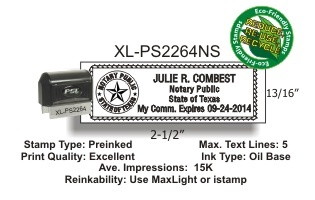 PREMIUM Self-Inker NOTARY STAMP(PSI), Model 2264, IMPRESSION AREA = 13/16in. x 2 1/2in. Excellent Print Quality. Black case w/ detachable dust cover.